to find and record old photographs of the area. The group grew to around twenty members and many were active in a range of local community activities. Local press coverage for the first exhibition. One project to encourage local participation and advertise the group was a ‘Photograph Yourself’ day in which local people were encouraged to come into a makeshift studio and make a self-portrait with a preset camera and lighting rig. 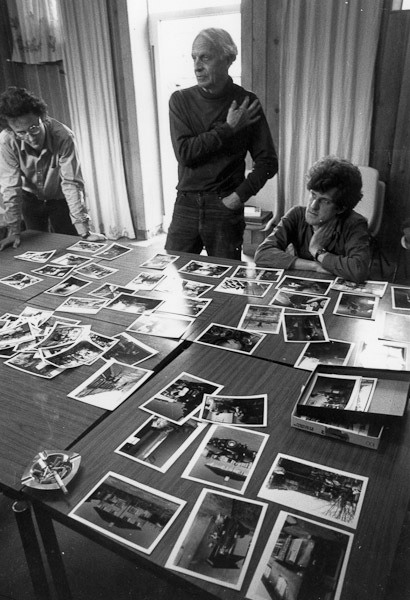 The results provided a literal ‘snapshot’ of the many and varied residents in the locale and were included in the group’s first community exhibition, Exposures, held in the Cambridge Lion Yard Library in September 1979. A second exhibition, Exposures 2, was brought to the local Mill Road Library for display in May 1980. 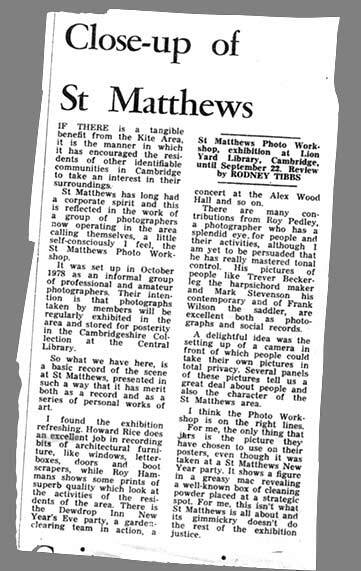 These modest beginnings catered for a growing local interest in photography and quickly showed the potential for a publicly accessible photographic darkroom in Cambridge. The group resolved to set up a community darkroom facility in the Bath House Neighbourhood Centre, an old public baths in the St Matthews area that local residents had fought to secure as a community resource when the building was threatened by demolition and redevelopment. 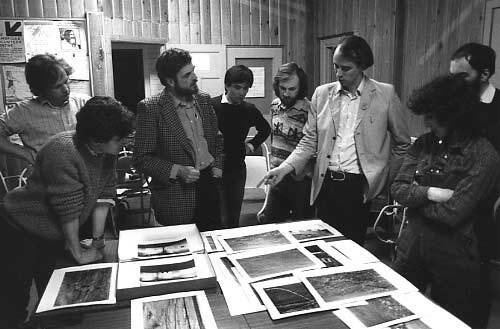 Towards this goal, in June 1980 the group transformed – renaming itself ‘The Cambridge Darkroom’ with ten founder members. In November 1980 the Eastern Arts Association gave the organisation a grant of £350 – this seemed quite a reasonable sum in those days. Work started on converting the old Public Baths’ boiler room into a community darkroom for monochrome processing and printing. 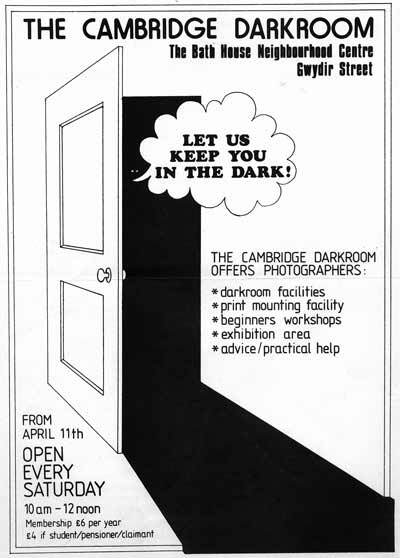 The first Cambridge Darkroom was launched and opened to the public on 11th April 1981. In addition to these practical facilities, the Darkroom quickly established the main elements of the activities that underpinned it in the coming years. During 1981 the first Beginners’ Workshop was held in May; Ron McCormick conducted an Urban Landscape Weekend Workshop in September; an open meeting to discuss members’ work was held in October; and in December Martin Parr’s exhibition ‘The Non-Conformists’ was brought to the Lion Yard Library in central Cambridge. The next two years saw workshops led by John Benton Harris (Documentary Photography), Ed Barber (About Face – self portraiture) and Professor Paul Hill (Beyond the Record). Touring exhibitions of the work of Nick Hedges, Glyn Satterly and Jane Bown were exhibited in libraries and public buildings in the city. Fine photography had arrived in Cambridge! However, the popularity and success of these early days soon exposed the limitations of the Darkroom as it was then: the reliance on voluntary effort; the lack of an established base from which to organize activities; and, crucially, no high quality, dedicated gallery space in which to show work and develop associated programmes. By early 1982 it was clear that the aims of the Darkroom could be achieved only by becoming a fully professional organisation with its own premises. This challenge was addressed on three fronts simultaneously. Successful bids for grant funding were made to the City Council, the Community Programme and the Eastern Arts Association. In August 1982 the Darkroom took office space in the Bath House as a campaign HQ; and in February 1983 Mark Lumley became the Darkroom’s first paid worker. Proposals to establish a gallery in the old Dales Brewery building, opposite the Bath House, were canvassed in April 1982; a prospectus setting out plans for the conversion of a unit in the old Brewery was published in March 1983; and in June 1983 the City Council agreed to lease the unit to the Darkroom. Work on converting the derelict space into a gallery, offices and darkrooms started in the autumn of 1983. The main structural work was carried out by paid contractors, but much of the interior finishing came about through the voluntary efforts of supporters and the commitment of the fledgling gallery staff – now comprising four paid workers. Edward Wright, Patron, talks with Carola Rush, Education Officer. 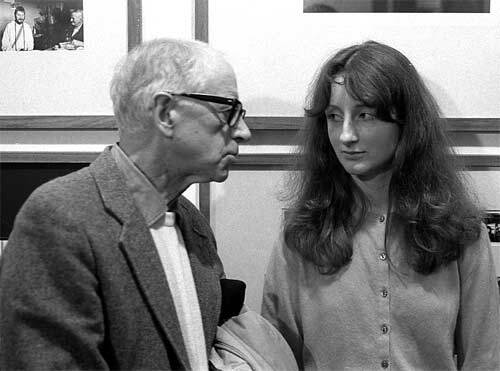 The artist and designer Edward Wright (renowned for his famous ‘New Scotland Yard’ signage), who had retired to live in the area, and photographer, artist & designer Humphrey Spender (perhaps best known for his work on the ‘Mass Observation’ project in the 1930s) agreed to become patrons of the Cambridge Darkroom. Also, artist and photographer Pavel Büchler, a local resident at the time – now Research Professor at Manchester Metropolitan University, took an interest in the project and became heavily involved in the preparations for the ‘New Cambridge Darkroom’ during 1983.